A bassoon whispers the first note, and a gentle yet almost eerie melody follows. Hundreds of eyes watch as the curtain is swept away to reveal the stage. The audience members gently tilt their heads to the side with curiosity as they take in the extravagant sight before them. A hand-painted masterpiece of blue skies and green, rolling hills fill the space. As elaborate as the sets are, the costumes are even more so. Hand painted material thickly covers the bodies onstage. Boots are laced up to the knees of every dancer. At first, it is almost impossible to tell which dancers are male and which are female. The dancers face each other in four separate circles. One circle stands while the other three sit strangely on the floor. Each group stares into the middle of their respective circle and seem to be ignorant to the fact that there is an audience watching. The only dancer facing the audience is an elderly woman, but she is crippled over with her head turned to the side. The music quickly changes, and beating drums pound through the air. The first group of dancers start to move. Every note of the complicated, uneven rhythm is pounded out with stomping turned in feet and jagged arms. 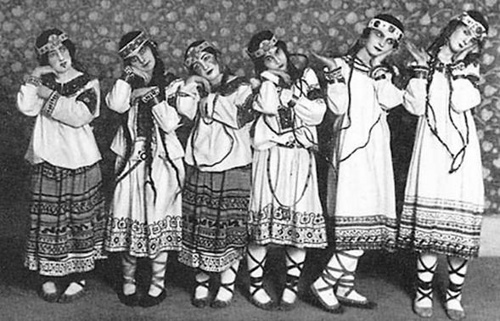 Me (third from right) in Hamburg Ballet's "Homage to Ballets Russes"
In 1913 Sergei Dhiagiliv, Igor Stravinsky, Valslav Nijinsky, and the Ballets Russes sent shock-waves throughout the art world with the premiere of The Rite of Spring. Ballet at this time was a very romantic art form. The audiences were used to seeing ethereal creatures float around the stage on their toes. The story lines consisted of fairies and simple love. I have no doubt that the audience walked into the Théâtre des Champs-Elysées of Paris expecting to see beautiful ballerinas elegantly dance around the stage. The Rite of Spring would prove to be anything but what the audience expected. As the ballet began, people were so outraged by what they saw and heard that the entire audience stood and shouted in protest. This new work pushed the boundaries of the time so much that it caused riots within the theater. It has now been 100 years since the premier of Nijinsky’s The Rite of Spring. This work was so important in the evolution of ballet because it proved that this performing art was capable of much more than was previously thought. It reshaped how creators, dancers, and audiences thought about ballet, and it continues to influence and inspire works of today. There have been many different versions created since Nijinsky’s, and I feel very fortunate to say that I have now been a part of three of them. During my short time inHamburg Ballet I danced in a program entitled “Homage to Ballets Russes”. Within this program we performed Nijinsky’s original version of The Rite of Spring, which was set by Millicent Hodson and Ken Archer, as well as John Neumeier’s version, Le Sacre. Both were extremely challenging for me, and I feel that having these experiences pushed me to grow in many ways. After The Rite of Spring was performed in 1913 it was almost completely lost. Millicent Hodson dedicated a large part of her life to resurrecting this important part of dance history. Along the way Millicent met Kenneth Archer whom not only became Millicent’s husband, but also played a very important part in bringing this work back to life. Together, they now set The Rite of Spring all over the world, and I was fortunate to be there when Hamburg Ballet learned this piece for the first time. While they taught us the steps, they also made sure they taught us the history. There was always a lot of discussion about what we were doing and why we were doing it. These two couldn’t help but exude their passion. They very quickly instilled that same passion within all of us about The Rite of Spring and the importance of its history. Above: me performing in Hamburg Ballet's "Homage to Ballets Russes"
John Neumeier’s version was quite different on the outside from Nijinsky’s, yet on the inside they shared the same great passion and understandings. While Nijinsky’s was decorated with elaborate costumes and sets, John’s was bare. We wore nothing but flesh colored tops and bottoms. This, in my opinion, showed the animalistic side of human beings. It left you with a raw, natural image and nothing to distract the eye from what the dancers were to portray. John first choreographed Le Sacre in 1972. The ballet had not been performed by the company in many years. I remember the process of reviving and learning the steps happened quite quickly. It was difficult for me to remember everything because it was the most contemporary thing I had done at the time. What I will never forget is the speeches John made about this work. In the middle of one of our rehearsals he stopped everything and expressed his unhappiness with our current progress. Up until that point the ballet masters only had time to teach us the steps, and I really did not know what was behind the movement. In one speech of a few minutes John quickly changed that though. He explained that his work was created during a difficult time in history. It was 1972 and the Vietnam War was a painful reality. Clashes of the authorities and the people were happening daily in his home country. He also spoke of nuclear war. He spoke of the devastating effects of nuclear bombs. All of the sudden it went from being a work that was simply difficult and intense, to a work that was extremely personal. We were representing not only the history of Nijinsky’s time with this ballet, but also of our own history. Being able to work with Yuri Possokhov on his version of The Rite of Spring has been a great process so far. As Yuri said himself, “it is important to have in the repertoire of any large company, and especially for choreographers,” and I believe that it is an important thing for dancers to experience as well. Yuri’s grounded and wild movement is perfect for this recreation of Stravinsky’s intense score. Stravinsky’s music strongly encapsulates this idea of a primal community and that is something that you will feel throughout the entire work. I must note that I found it interesting that there were no principals involved in this creation. While the whole company is very close and works well together, all of us in the corps and soloist ranks work together so often that we have an undeniable connection in rehearsal, offstage as well as onstage. I think that having this connection during the creation process has truly shaped how it all turned out. Even the “chosen one” — which is the principal female role — is a corps de ballet dancer in one cast and a soloist dancer in the other. This has enabled all of us to work together on a very intimate and comfortable level. When Nijinsky and Stravinsky created The Rite of Spring 100 years ago it became an important turning point for the world of ballet. I’m so happy that I have been able to honor that time in dance history by learning three different versions. Yuri Possokhov’s version of The Rite of Spring is a very exciting premier for San Francisco Ballet; as Yuri said in the program notes, it reflects “what’s happening in the world, some dark sides of our society… this music is so matched to political and social life of the earth.’” Yuri has said that there is a deep meaning behind this music, and I believe that he truly, honestly, and successfully encapsulates those meanings within his choreography. I can’t wait for you to experience The Rite of Spring for yourselves.